This last weekend was a 3 day holiday. Normally we would have gone camping but hubby was away in China and got back really late Friday night plus Ebi-kun had yochien Saturday morning. (He told his yochien teacher that daddy had gone to North Korea, lol, she was a bit worried but then the next day he said daddy was in Shanghai, phew.) Then in the afternoon the boys went to football practice and I tried to get a couple of projects finished and out of the way. 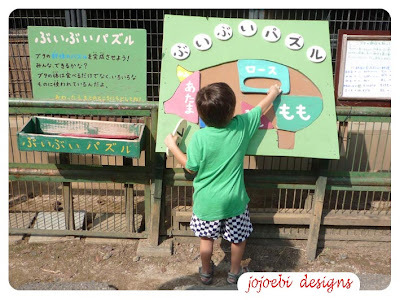 So Sunday we decided to go to Saitama Children's Zoo, I have blogged about this place before, it is one of our favourite spots. When we got there they were doing giraffe enrichment! They were basically telling the public what they do to keep the giraffes happy, they don't have enough tall trees to feed from all the time so they give them pellets, like pony nuts but for giraffes but they scoff them too fast and then get bored because there is not a lot else to do. So the keepers have made feeding boxes which make it more difficult for the giraffes to feed and they have to use their tongue in the same way that they would in the wild. Feeding them like this means they spend much of their day feeding like they do in a natural environment. 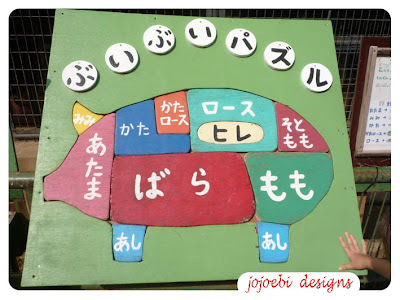 and the finished puzzle shows the different 'cuts' of meat on a pig! In the petting area there was also a very pregnant goat, I showed Ebi-kun how to feel her belly to see if he could feel the baby move, and it did! 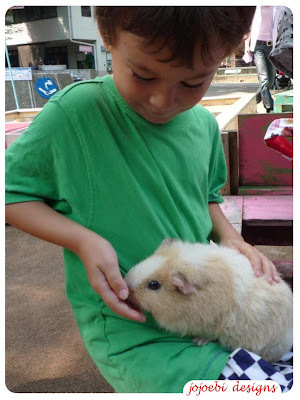 We also had to go and pet the guinea pigs, we have just watched the Film G-Force so guinea pigs are a big hit just now. After went to see the lesser pandas but there was only one out, there was a sign saying that there were new babies in the family and they will be out in the autumn, so we will have to go back, lesser pandas are just soooo cute! Precious photo with the guinea pig - my kids love that movie too! we used runny glue, the stuff we have here is a slight goldish colour, just paper glue, I haven't tried it with any other glue yet..